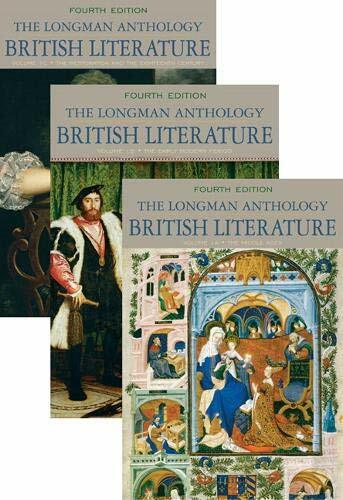 The Fourth Edition of The Longman Anthology of British Literature continues its tradition of presenting works in the historical context in which they were written. This fresh approach includes writers from the British Isles, underrepresented female authors, “Perspectives” sectionsthatshed light on the period as a whole and link with immediately surrounding works to help illuminate a theme, “And Its Time” clusters that illuminate a specific cultural moment or a debate to which an author is responding, and “Responses” in which later authors respond to one or more texts from earlier works. David Damrosch is Professor of Comparative Literature at Harvard University. He is a past president of the American Comparative Literature Association, and has written widely on world literature from antiquity to the present. His books include What Is World Literature? (2003), The Buried Book: The Loss and Rediscovery of the Great Epic of Gilgamesh (2007), and How to Read World Literature (2009). He is the founding general editor of the six-volume Longman Anthology of World Literature, 2/e (2009) and the editor of Teaching World Literature (2009). Kevin J. H. Dettmar is W. M. Keck Professor and Chair, Department of English, at Pomona College, and Past President of the Modernist Studies Association. He is the author of The Illicit Joyce of Postmodernism and Is Rock Dead?, and the editor of Rereading the New: A Backward Glance at Modernism; Marketing Modernisms: Self-Promotion, Canonization, and Rereading; Reading Rock & Roll: Authenticity, Appropriation, Aesthetics; the Barnes & Noble Classics edition of James Joyce’s A Portrait of the Artist as a Young Man and Dubliners; and The Blackwell Companion to Modernist Literature and Culture, and co-general editor of The Longman Anthology of British Literature. Christopher Baswell is A. W. Olin Chair of English at Barnard College, and Professor of English and Comparative Literature at Columbia University. His interests include classical literature and culture, medieval literature and culture, and contemporary poetry. He is author of Virgil in Medieval England: Figuring the "Aeneid" from the Twelfth Century to Chaucer, which won the 1998 Beatrice White Prize of the English Association. He has held fellowships from the NEH, the National Humanities Center, and the Institute for Advanced Study, Princeton. Clare Carroll is Director of Renaissance Studies at The Graduate Center, City University of New York and Professor of Comparative Literature at Queens College and at The Graduate Center, CUNY. Her research is in Renaissance Studies, with particular interests in early modern colonialism, epic poetry, historiography, and translation. She is the author of The Orlando Furioso: A Stoic Comedy, and editor of Richard Beacon's humanist dialogue on the colonization of Ireland, Solon His Follie. Her most recent book is Circe's Cup: Cultural Transformations in Early Modern Ireland. She has received Fulbright Fellowships for her research and the Queens College President's Award for Excellence in Teaching. Andrew Hadfield is Professor of English at The University of Sussex. He is the author of a number of books, including Shakespeare and Republicanism (2005), which was awarded the 2006 Sixteenth-Century Society Conference Roland H. Bainton Prize for Literature; Literature, Travel and Colonialism in the English Renaissance, 1540-1625 (1998); and Spenser's Irish Experience: Wilde Fruyt and Salvage Soyl (1997). He has also edited a number, most recently, with Matthew Dimmock, Religions of the Book: Co-existence and Conflict, 1400-1660 (2008), and with Raymond Gillespie, The Oxford History of the Irish Book, Vol. III: The Irish Book in English, 1550-1800 (2006). He is a regular reviewer for the TLS. Heather Henderson is a freelance writer and former Associate Professor of English Literature at Mount Holyoke College. A specialist in Victorian literature, she is the recipient of a fellowship from the National Endowment for the Humanities. She is the author of The Victorian Self: Autobiography and Biblical Narrative. Her current interests include home-schooling, travel literature, and autobiography. Peter J. Manning is Professor at Stony Brook University. He is the author of Byron and His Fictions and Reading Romantics, and of numerous essays on the British Romantic poets and prose writers. With Susan J. Wolfson, he has co-edited Selected Poems of Byron, and Selected Poems of Beddoes, Hood, and Praed. He has received fellowships from the National Endowment for the Humanities and the John Simon Guggenheim Memorial Foundation, and the Distinguished Scholar Award of the Keats-Shelley Association. Anne Howland Schotter is Professor and Chair of English and Associate Dean of the Faculty at Wagner College. She is the co-editor of Ineffability: Naming the Unnamable from Dante to Beckett and author of articles on Middle English poetry, Dante, and Medieval Latin poetry. Her current interests include the medieval reception of classical literature, particularly the work of Ovid. She has held fellowships from the Woodrow Wilson and Andrew W. Mellon foundations. William Sharpe is Professor of English Literature at Barnard College. A specialist in Victorian poetry and the literature of the city, he is the author of Unreal Cities: Urban Figuration in Wordsworth, Baudelaire, Whitman, Eliot, and Williams. He is also co-editor of The Passing of Arthur and Visions of the Modern City. He is the recipient of Guggenheim, National Endowment of the Humanities, Fulbright, and Mellon fellowships, and recently published New York Nocturne: The City After Dark in Literature, Painting, and Photography. Stuart Sherman is Associate Professor of English at Fordham University. He received the Gottschalk Prize from the American Society for Eighteenth-Century Studies for his book Telling Time: Clocks, Diaries, and English Diurnal Form, 1660-1775, and is currently at work on a study called “News and Plays: Evanescences of Page and Stage, 1620-1779.” He has received the Quantrell Award for Undergraduate Teaching, as well as fellowships from the American Council of Learned Societies, the Chicago Humanities Institute, and Princeton University. Susan J. Wolfson is Professor of English at Princeton University and is general editor of Longman Cultural Editions. A specialist in Romanticism, her critical studies include The Questioning Presence: Wordsworth, Keats, and the Interrogative Mode in Romantic Poetry, Formal Charges: The Shaping of Poetry in British Romanticism, and Borderlines: The Shiftings of Gender in British Romanticism. She has also produced editions of Felicia Hemans, Lord Byron, Thomas L. Beddoes, William M. Praed, Thomas Hood, as well as the Longman Cultural Edition of Shelley’s Frankenstein. She received Distinguished Scholar Award from Keats-Shelley Association, and grants and fellowships from American Council of Learned Societies, National Endowment for the Humanities, J. S. Guggenheim Foundation, and Andrew W. Mellon Foundation. She is President (2009-2010) of the Association of Literary Scholars, Critics, and Writers. Damrosch, David; Dettmar, Kevin J. H.; Baswell, Christopher; Carroll, Clare; Hadfield, Andrew David; Henderson, Heather; Manning, Peter J.; Schotter, Anne Howland; Sharpe, William Chapman; Sherman, Stuart; Wolfson, Susan J.
Damrosch, David; Dettmar, Kevin J. H.; Baswell, Christopher; Hadfield, Andrew David; Carroll, Clare; Henderson, Heather; Manning, Peter J.; Schotter, Anne Howland; Sharpe, William Chapman; Sherman, Stuart; Wolfson, Susan J.